The Santiago Canyons are unlike any other place in Orange County, CA. In these rustic canyon communities, you are minutes away from freeways, shopping, and the major cities, yet you feel like you are living in a different world. Mature landscape, vintage cabins, freedom from homeowners associations, and miles of open space, separate these areas from all other communities in Orange County. If you are looking for a true "getaway" location that is surrounded by nature, yet is only a few miles from traditional urban living, a home in the Santiago Canyons may be for you. You can learn about the history of the canyons here. 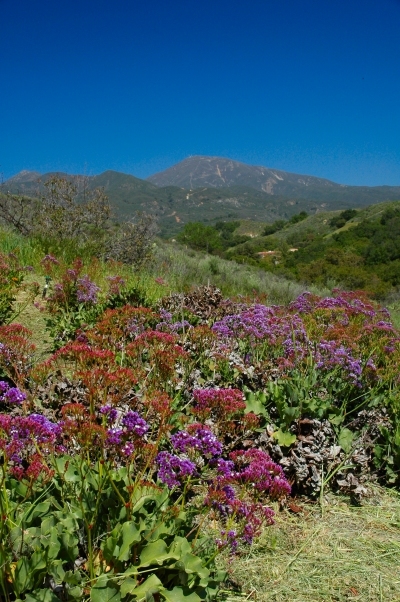 The Santiago Canyons include Modjeska, Silverado, & Trabuco Canyons, as well as number of minor canyons, including Holy Jim, Ladd, Rose, Harding, Black Star, and Williams Canyons. They are located at the base of the Saddleback mountains in South Orange County, CA. and because of this, the area is also known as Saddleback Canyon. Surrounded largely by the Cleveland National Forest and the Irvine Ranch Land Reserve, the area is dotted with ancient live oaks, majestic sycamores, seasonal streams, and picturesque views. Homes and real estate in Modjeska, Silverado, and Trabuco Canyons range from decades-old cabins, rustic bungalows, modest family homes, impressive ranches, and equestrian estates. No condos or town homes here, but you will find single family cabins, fixer-uppers, bank owned, horse properties, and custom homes for sale, lease, rent, as well as land. Cabins in the Cleveland National Forest and build able lots can be found here. The canyons have a lot of wonderful attributes but they are not for everyone. If you haven't been out to Orange County's canyon communities, it's a good idea to take a drive around the canyons and get to know the area before requesting any home showings. Prices for homes in the canyons may often be lower than comparable homes in the suburbs. Please keep in mind however, that many canyon homes are older (1930s to 1950s). These homes may be in need of maintenance or rehabilitation; especially if the price looks to good to be true. It is also not unusual to discover that a canyon home has additions that were done long ago (and often without permits). This can often be uncovered when the County tax records indicate a smaller square footage than is advertised in the MLS. If you decide to buy a canyon home, it is always advisable to get a professional home inspection. Be sure the inspection includes checking the electrical panel and wiring, roof, foundation, exterior drainage (especially near slopes), and the septic system. Some of these additional inspections may be at an extra cost, but they are well advised. 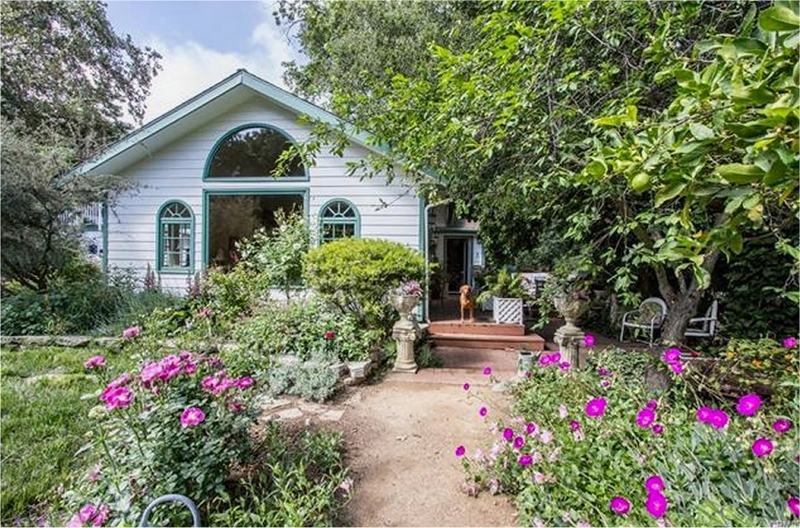 Featured property - Modjeska Canyon gem loaded with country charm! 17362 Olive Hill Road, Modjeska Canyon - Call me to see this one! 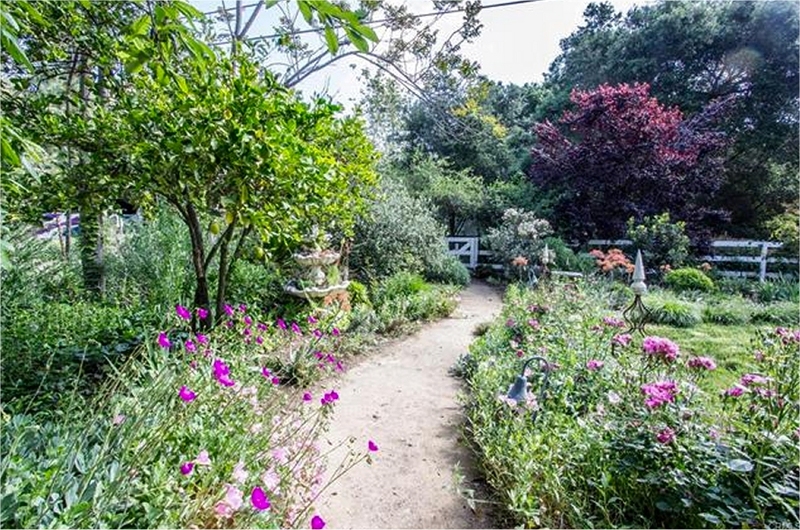 Tranquil and serene, surrounded by majestic oaks and sycamore trees, a true gardener's delight! Interior upgrades, oversized lot and creek side location make this property a "must see" for anyone interested in a beautiful, rural canyon location. Peaceful, yet close to all the highlights of Modjeska Canyon and canyon life in general. Walk to Tucker Wildlife Sanctuary and the historical Modjeska Home. 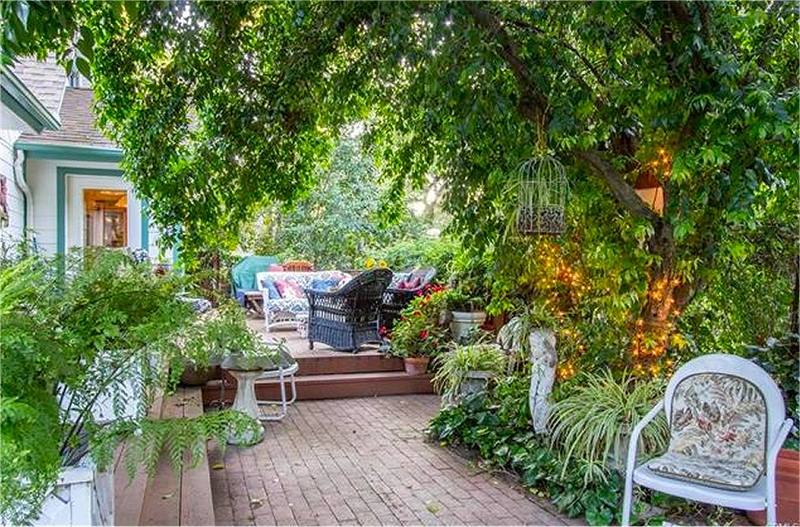 This 4 bedroom, 3.5 bath home was significantly upgraded in 1999 and includes new concrete siding, beautiful picture windows, entertaining deck and a drought tolerant, cottage garden to die for. Listen to the light "croak" of the native tree frogs from your creek side deck and outdoor patio area while entertaining outside or inside with this open floor plan. 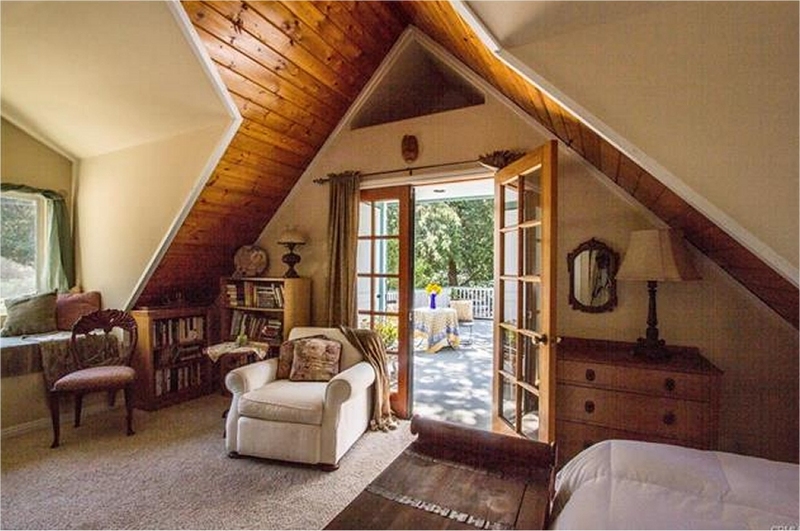 French doors lead to a large deck off the master bedroom. 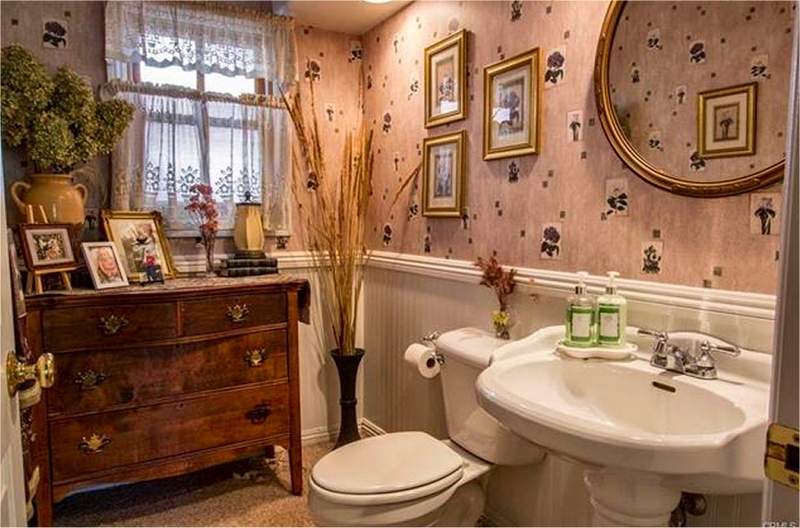 Each of the downstairs bedrooms has their own private bathroom. This is a private lot that can accommodate RV parking or horse. Park in your oversized two car garage with direct access. 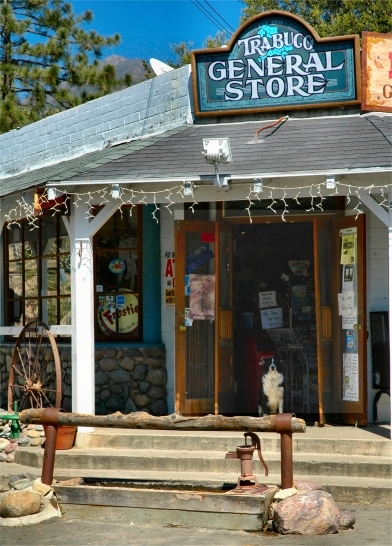 Modjeska Canyon is best known for Arden, the Helena Modjeska Historic House and Gardens, plus the Tucker Wildlife Sanctuary, a local nature preserve. 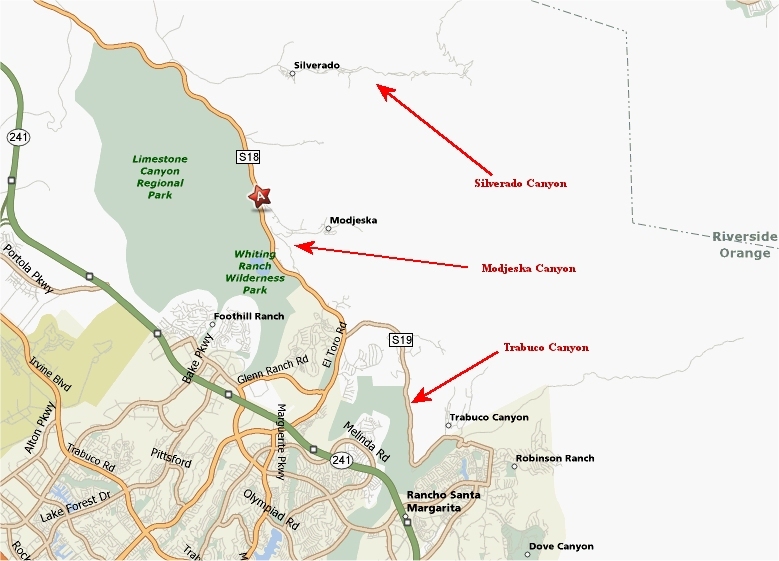 Modjeska Canyon is located off of Santiago Canyon Road between Silverado (east) and Trabuco (west) Canyons. This area has many newer single family and luxury homes, as well as decades-old cabins. The following links contain searches for Modjeska Canyon real estate, homes for sale, lease, and rent, as well as lots and land, and bank owned properties. 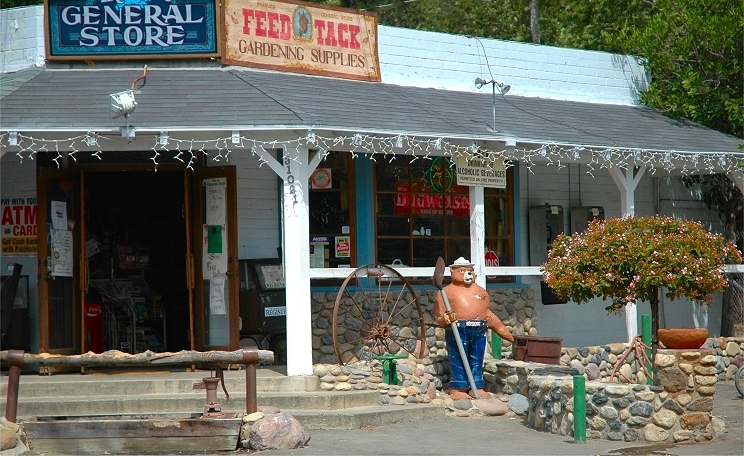 Historic Silverado Canyon was once home to silver mining in the 1800s. Most of the homes here, were built in the 1930s or 1950s, giving this canyon a rustic feel. Silverado Canyon is the eastern most canyon of the three, and is closest to the North Orange County cities of Orange and Villa Park. Listed under Silverado Canyon are also the areas of Santiago Canyon Estates, Wildcat Canyon, and Williams Canyon. Use the following links to find Silverado Canyon homes for sale, lease, lease option, and rent, plus lots, land, acreage, and bank owned homes or houses. Silverado Canyon Realty. Call me if you are interested in Silverado Canyon real estate. 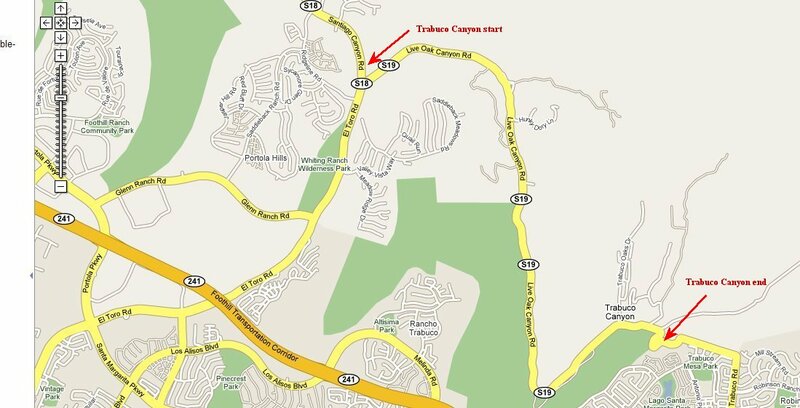 Trabuco Canyon runs along the length of Live Oak Canyon Road. It is easy to reach from both Lake Forest (via El Toro Road) and Rancho Santa Margarita (via Plano Trabuco Road). 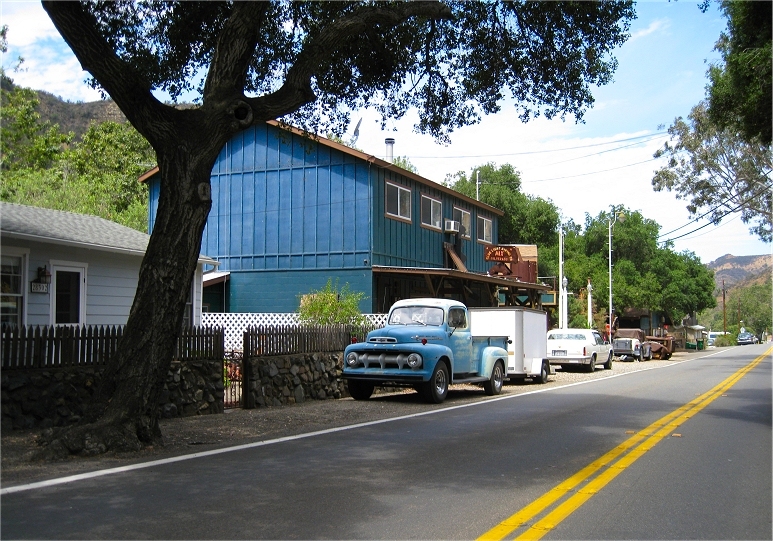 A notable landmark on the north side of Trabuco Canyon is Cook's Corner, a weekend biker bar that was originally a military barracks, brought over and put in place at the mouth of the canyon. At the opposite end is O'Neil Regional Park, as well as Rose Canyon Cantina and Trabuco Oaks Steak House. It is the canyon closest to the South Orange county cities of Rancho Santa Margarita, Mission Viejo, and Lake Forest. 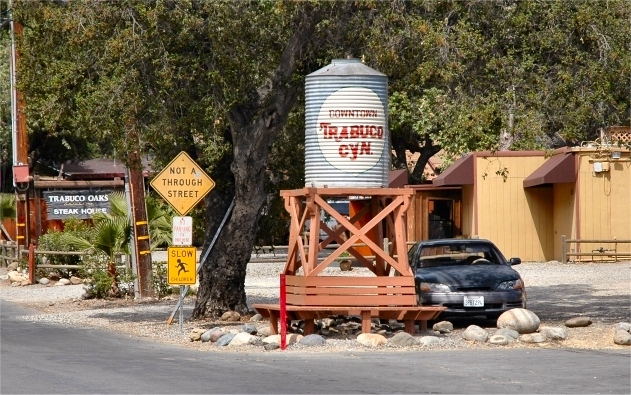 Trabuco Canyon includes many smaller canyons and whimsical roads, such as Rose Canyon, Holy Jim Canyon, Hunky Dory Road, Hamilton Trail, and Mountain View Road. It is also close to Live Oak Canyon Sables, a local horse boarding facility. Use the following links to find Trabuco Canyon real estate and homes for sale, lease, and rent, plus lots, land, acreage, and bank owned (REO) homes or houses. All canyon properties may be used as horse properties, assuming enough room on the lot. 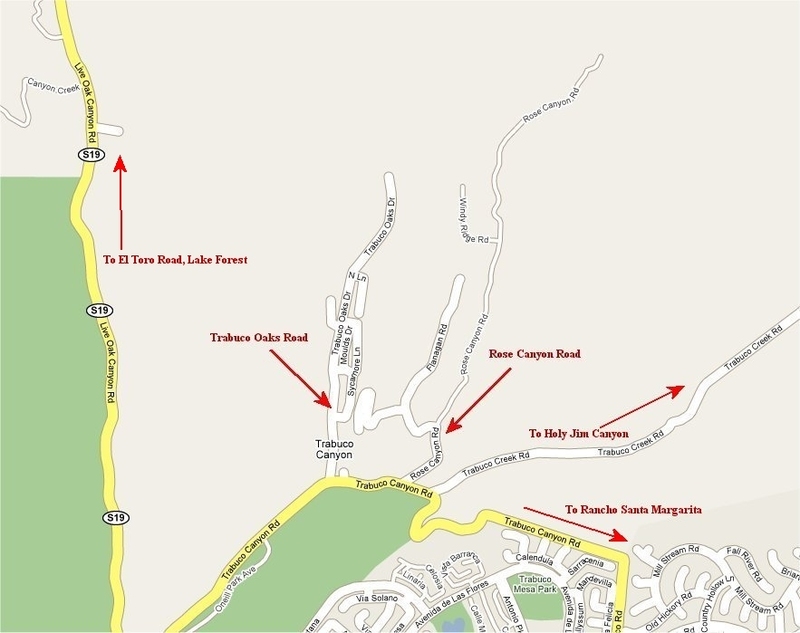 There are several properties with horse facilities along Mountain View Road n Trabuco Canyon. There are also a good number of vacant lots available. Many may already have utility and water lines to the property. Permits to build may be challenging however, and you should check with the County of Orange on how long it will take to get permits approved. There are never many homes for lease or rent in the canyons. The few that do come up on the MLS will be listed below. It's always a good idea to take a drive through the canyon's' winding roads to be sure that this is the area you would like to call home. In fact, I will not show a home in the canyons unless you are very familiar with the area. Note: I have a new FAQ page for buying and building on lots in the canyons here. Please visit this page if you are thinking of buying a lot in the canyons. Black Star Canyon Located off of Santiago Canyon Road and at the mouth of Silverado Canyon. This canyon has a mysterious nature and its colorful, often dark history has given rise to a whole host of urban legends and ghost stories throughout the Orange County area. It is a popular destination for mountain bikers due to its scenery and the fact that its main access road is closed to automobile traffic. There are no homes for sale in this canyon. 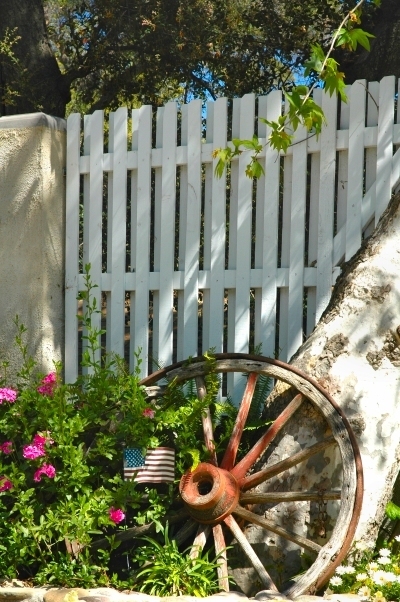 Hamilton Oaks is a gated community of custom homes in Trabuco Canyon, not far from Cooks Corner. It is the home of Hamilton Oaks Vineyards, a small, family owned canyon winery. There are never many homes for sale in Hamilton Oaks, but they are definitely worth seeing when one comes on the market. 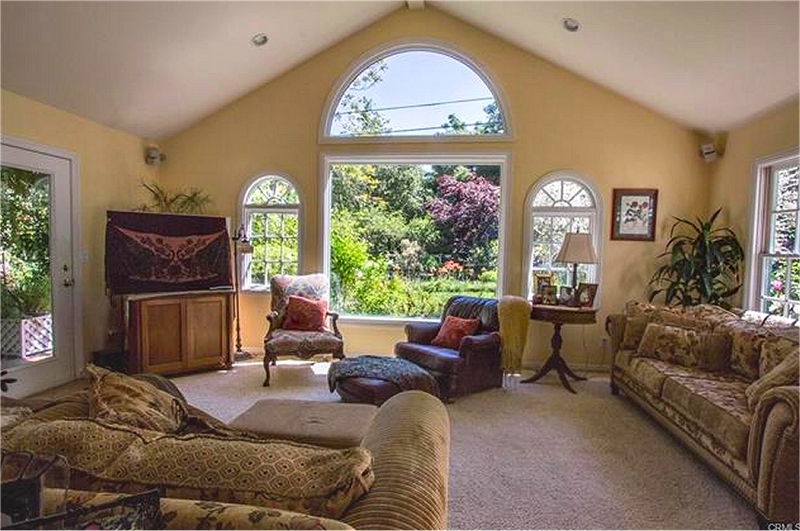 Many of the homes are large and they are also on generous (sometimes multi-acre) lots. 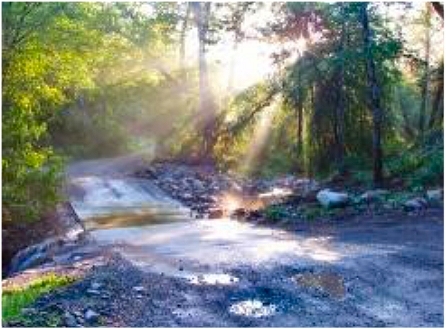 It is also a great, though relatively unknown, horse property area with miles of trails. Please contact me if you are interested in getting a list of homes for sale in Hamilton Oaks. Harding Canyon is a small canyon off of Modjeska Canyon (see Modjeska Canyon map) . There are a few homes that occasionally come up for sale in this canyon. Holy Jim Canyon in Trabuco Canyon is located on the other side of a rugged five mile dirt road known as Trabuco Creek Road. Popular with hikers and mountain bikers, this canyon is the home to several dozen recreational cabins located on National Forest land. The cabins are have a renewable 20 permit (lease) on the land but the structures are privately owned and a few do come up for sale occasionally. They are intended for recreational use only however, and full time occupancy is not really allowed. Holy Jim Canyon cabins for sale in the Cleveland National Forest are typically listed under Trabuco Canyon. 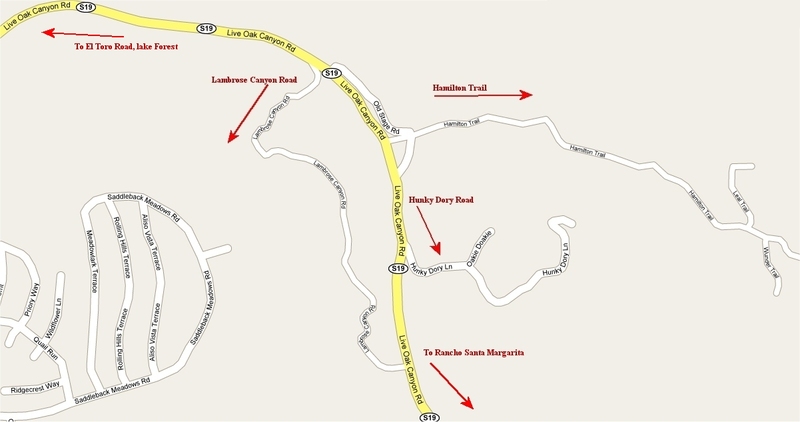 Cabins have addresses listed as either Holy Jim Road or Trabuco Creek Road. Call me if you are interested in a cabin in Holy Jim Canyon or property in the Cleveland National Forest. You can read more about cabins in Holy Jim here. Jackson Canyon is a small canyon off of Santiago Canyon road. There are a few homes that occasionally come up for sale in this canyon. Ladd Canyon is a small canyon off of Silverado Canyon (see Silverado Canyon map). There are a few homes that occasionally come up for sale in this canyon. Modjeska Grade - A hillside area of custom homes off of Santiago Canyon road and connecting with Modjeska Canyon. 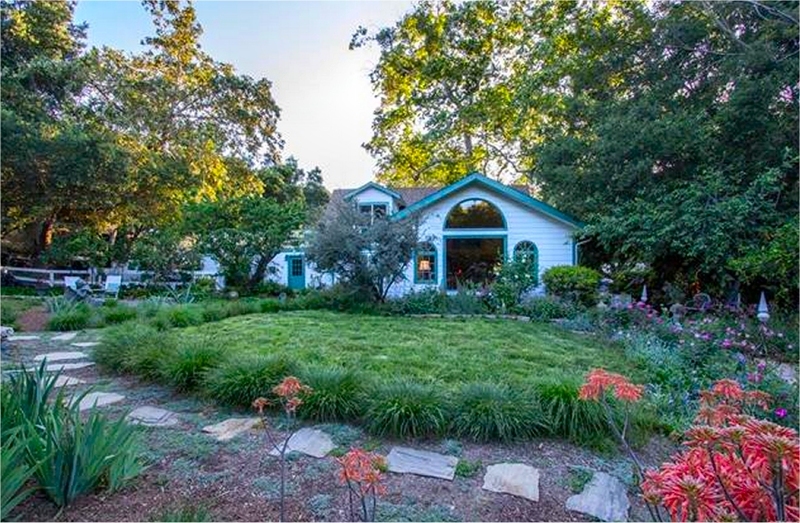 Many of the homes on Modjeska Grade are elaborate custom homes with large lots and magnificent views, due to the hillside location. 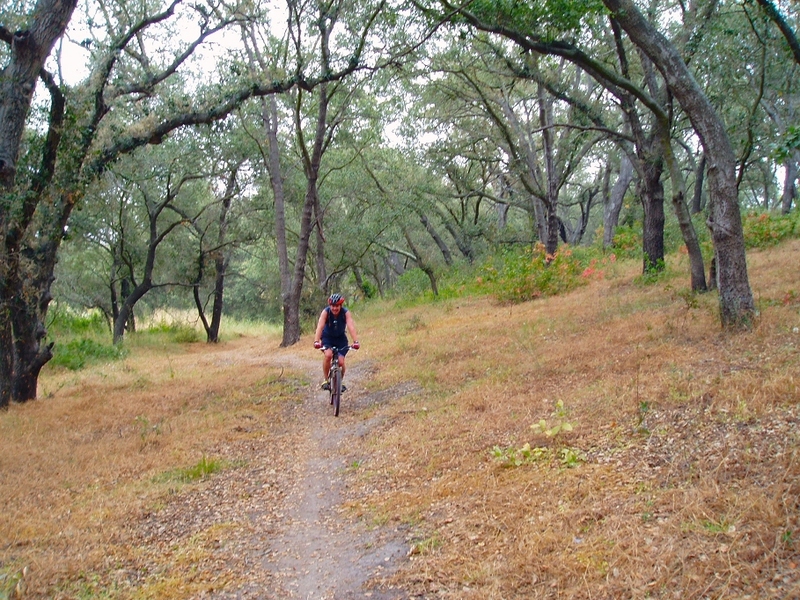 Rose Canyon - A sub-canyon of Trabuco Canyon (see Trabuco Canyon map). Rose canyon does have homes that occasionally come up for sale. It is also the location of Rose Canyon Cantina, a fine, indoor and outdoor Mexican restaurant, and also the Joplin Youth Center , a juvenile correctional facility. Santiago Canyon Estates is a community of luxury tract homes built in the late 1990s, and located off of Santiago Canyon Road, past Cooks Corner. You can search for homes for sale in Santiago Canyon Estates by searching Silverado Canyon homes for sale. Wildcat Canyon is a small canyon located off of Silverado Canyon near the fire station. Homes for sale here, would be listed under Silverado Canyon. Williams Canyon is a small canyon located off of Santiago Canyon Road, between the entrances of Modjeska and Silverado Canyons. An enclave of large lots, horse property, and custom homes, Williams Canyon homes, lots, and real estate can be searched by using the Search Silverado Canyon homes for sale link. Silverado Elementary School is a small school located on Santiago Canyon blvd very close to Silverado Canyon. (Regrettably, this school has been closed). 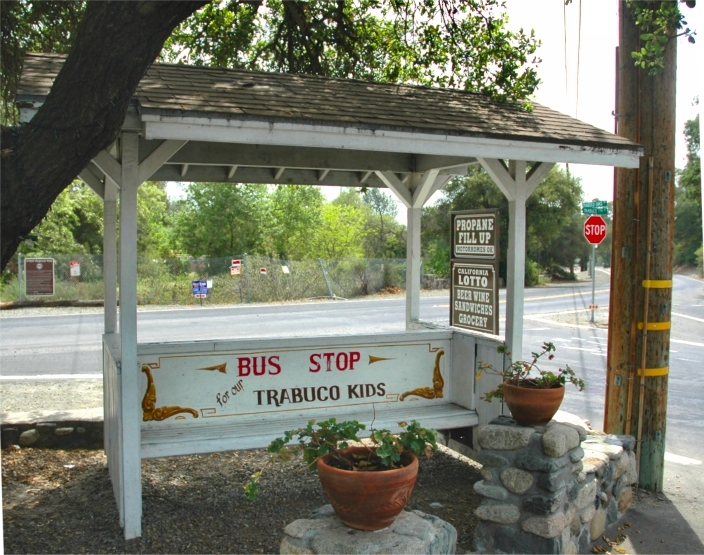 Trabuco Oaks Steak House - A fixture in Trabuco Canyon for several decades. Rose Canyon Cantina & Grill - Another favorite in Trabuco Canyon - Great Mexican food. Rancho Las Lomas - This is beautiful private ranch that often hosts wedding and special venues. They also have a zoological garden with many exotic animals, like tigers. Holy Jim Falls A web site about the water falls and hike in Holy Jim Canyon. I will be glad to help you buy, sell, or lease a home or help you locate Modjeska Canyon, Silverado Canyon, Trabuco Canyon, Santiago Canyon, or Saddleback Canyon real estate and ranches for sale. Please call me to discuss your needs!